molbloc-S® Sonic Nozzle Flow Element is a high precision transfer standard intended for calibrating other transfer standards or process flow meters and controllers. This sonic nozzle calibration device is used with molbox1+ or molbox RFM™ terminals to extend the range of molbloc/molbox™ calibration systems and deliver superior accuracy at medium and high flows. Existing molbox1 terminals with version 4.0 embedded software or later and all molbox1+ terminals can be used with molbloc-S. Excellent rangeability (10:1 turndown), with molbox1+S, or other molbox models with vacuum. 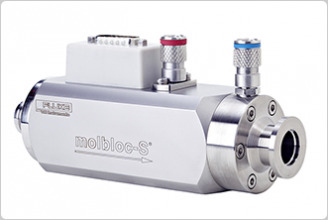 The mass flow rate through molbloc-S Sonic Nozzle is directly proportional to the upstream absolute pressure and independent of the downstream or differential pressure. molbloc-S flow ranges are defined by the molbloc's Pressure to Flow Conversion Ratio, KF. KF is expressed in units of sccm/kPa and defines the relationship between mass flow and the absolute upstream pressure delivered to the molbloc-S. molbloc-S calibrations are performed over flow ranges corresponding to either 20 to 200 kPa (3 to 30 psia), 50 to 500 kPa (7 to 70 psia) or 200 kPa to 2 MPa (30 to 300 psia) upstream pressure. For flow measurements to be valid, the flow at the throat of the molbloc-S venturi nozzle must be critical, i.e. the gas speed is equal to the local speed of sound. Critical flow is achieved when a sufficiently low back pressure ratio, or BPR (molbloc-S downstream absolute pressure divided by upstream absolute pressure) is maintained. The upper limit of acceptable molbloc-S BPR values for critical flow varies between about 0.5 and 0.9 depending on the Reynolds number of the flow. Since the mass flow through molbloc-S is proportional to the upstream absolute pressure, the flow range for this sonic nozzle calibration device in an application may be limited by the BPR limit. To maximize the range of a molbloc-S element, a vacuum pump can be connected downstream to reduce the downstream pressure while flowing. When the downstream pressure is kept sufficiently low, the upstream pressure, and thus the mass flow rate, can be adjusted all the way down to the minimum value for the molbloc's calibration type without being limited by the BPR. 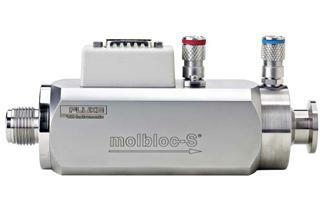 If molbloc-S will be used with atmospheric pressure downstream (no vacuum pump), then the molbloc can only be used over a range of upstream pressures starting at the maximum pressure for its calibration type down to a minimum pressure value at which the BPR becomes equal to the BPR limit at the current Reynolds number. molbox1 terminals include features to measure BPR, automatically alert the operator when the BPR is too high and prevent measurements when flow is not critical. All specifications same molbox1 unless specified otherwise. Normal Operating Pressure Range: 20 to 200 kPa absolute (3 to 30 psia) or 50 to 500 kPa absolute (7 to 70 psia) upstream, or 200 to 2000 kPa (30 to 300 psia) with molbox1+S only. Optional: N2 (to replace standard air calibration or in addition), Ar, H2, He, N2O. Consult factory regarding availability of availability of these gases for specific ranges, or for other gases.